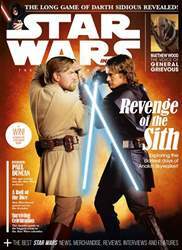 (4 Customer Reviews) | Write Review 8 issues per year Check out the new look Star Wars Insider! The official Star Wars Insider magazine is your indispensible guide to the saga. Discover the secrets behind the most popular space fantasy of all time, with exclusive interviews with the creators, cast, and crew of the entire Star Wars saga. This essential magazine covers everything from blockbuster movies to award-winning animated TV shows, via comic books, novels, video games and more – and it’s all available digitally so you don’t even have to leave your home to visit a galaxy far, far away! Star Wars Insider #188 is on sale NOW! Follow our continuing journey through the Skywalker saga, as we reach the darkest point so far, the pivotal chapter in the Jedi Knight's life as he adopts the mantle of Darth Vader, and a boundless love is transformed into endless hate. We explore the darkest days of Anakin Skywalker in Revenge of the Sith! Skywalker Sound recording genius Matthew Wood reveals how he became the voice of cybernetic villain General Grievous! Insider interviews Paul Duncan, the author who journeyed into the Lucasfilm vaults to uncover 'The Star Wars Archives: 1977-1983'. We celebrate the ongoing appeal of Star Wars board games and the meteoric rise of tabletop gaming. Plus, don't miss out on our essential guide for surviving Star Wars Celebration! Check out the new look Star Wars Insider! The official Star Wars Insider magazine is your indispensible guide to the saga. Discover the secrets behind the most popular space fantasy of all time, with exclusive interviews with the creators, cast, and crew of the entire Star Wars saga. This essential magazine covers everything from blockbuster movies to award-winning animated TV shows, via comic books, novels, video games and more – and it’s all available digitally so you don’t even have to leave your home to visit a galaxy far, far away! You'll receive 8 issues during a 1 year Star Wars Insider magazine subscription. Nice magazine, the digital version runs really smoothly, however I think maybe just consider lowering the prices slightly. Very nicely done magazine for Star Wars fans. This is the Rogue One of magazines and just to confirm... I loved Rogue One. The specials are great, even if a little pricey for digital editions. You'll receive 8 issues during a 1 year Star Wars Insider magazine print subscription.